Ahmad is a Senior Investment Manager at Arzan VC focusing on early growth and high growth stage technology startups. Prior to joining Arzan VC, Ahmad was an advisor for the MIT Arab Enterprise Forum and he was a founding team member of two Arab VC firms. He has more than 10 years of experience. Ahmad is also a member of Endeavor Global Investor Network, and a judge and mentor at MIT Arab Startup competition, Microsoft Innovation Center (Jordan), Queen Rania National Entrepreneurship Competition (QRNEC), Startup Weekend (Amman, Cairo, Riyadh), ArabNet Startup Demo, Creative Business Cup (CBC), Seed Startup Accelerator, Oasis500 Accelerator, and iPark Incubator. Ahmad is one of the foremost VC Bloggers in the Middle East, and he blogs on VCpreneur.com. He is a Kauffman Fellow, and he went to Harvard’s VC training program. 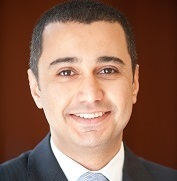 Ahmad holds an MBA from New York Institute of Technology (NYIT), and a B.Sc. degree in Electronics Engineering from Princess Sumaya University of Technology (PUST).